This article is Part III in a series about achieving a better divorce. In Part I, you worked on the Big Picture view for yourself and your family. You spent time thinking about this and writing about it in detail in your journal. In Part II, you learned the value of getting informed about your process choices, or the various ways you can actually get divorced. This is a critical step to helping you be proactive for yourself. How in the world can you make the best decisions if you don’t even know what your choices are? This article is Part II in a 3 part series about achieving a better divorce. Yes, it is possible to achieve a better divorce, but, as you probably know by now if you are in the midst of this process, it’s not easy. It takes consistent effort and intention to make your divorce the best it can be under your particular circumstances. In a recent article, 3 Steps to Achieving a Better Divorce, I wrote about how important it is for people to be informed and proactive when going through the challenging time of a separation or divorce. 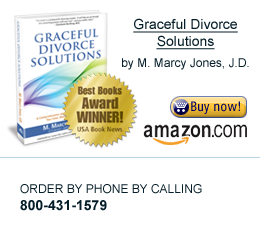 I outlined a Three Step Formula to help you have a better divorce. In this three-part series, I will zero in on each of those steps, giving you more detail and direction so you can truly benefit from this formula. You’ve heard it before – change your thinking, change your life. It’s true. Many of us don’t realize how much the way we think about things impacts the way our life goes. Sometimes just small tweaks in our thought processes can make big differences in the choices we make. These experiences are those wonderful “Ah-Ha!” moments, when the light bulb goes on and we realize there just might be another way of doing something.